Troye Sivan is an Australian-South African singer-songwriter, actor, and YouTuber. He became famous as a singer on YouTube and in Australian talent competitions. He has more than 6.8 million subscribers to his self-titled YouTube channel. In 2013, he signed with EMI Australia and released his debut extended play, TRXYE (2014), which peaked at #5 on the U.S. Billboard 200. He released his debut studio album, Blue Neighbourhood, in 2015, which reached at #23 in the billboard Top 40 single. His notable songs include “Happy Little Pill,” “Wild,” “Talk Me Down,” “Youth”, and “My My My!”. As an actor, he made his acting debut in the 2009 film X-Men Origins: Wolverine and starred as the title character in The Spud Franchise. He won an award at the 2014 Teen Choice Awards for “The Boyfriend Tag”, video that featured fellow Youtuber Tyler Oakley. 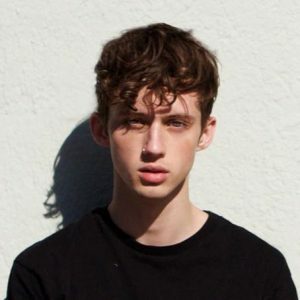 Born Troye Sivan Mellet on June 5, 1995 in Johannesburg, South Africa, to parents Laurelle and Shaun Sivan, he was raised in a Modern Orthodox Jewish family. He has two brothers and one sister, Steele, Tyde and Sage. Sivan moved with his family to Australia when he was age two. He attended Carmel School, a private Modern Orthodox school in Perth. He began his YouTube channel at the age of 12, and made his acting debut at age 14. In 2016, he began dating model Jacob Bixenman. *He was born on June 5, 1995 in Johannesburg, South Africa. *His dad was raised Jewish, and his mom converted to Judaism. *He also plays piano and bass guitar. *He was a finalist on “Star Search 2007.”. *His video “The Boyfriend Tag” with Tyler Oakley earned them a Teen Choice Award in the “Choice Web Collaboration” category in 2014. *Time named him as one of the “25 Most Influential Teens of 2014” in October 2014. *Currently, he resides in Los Angeles.